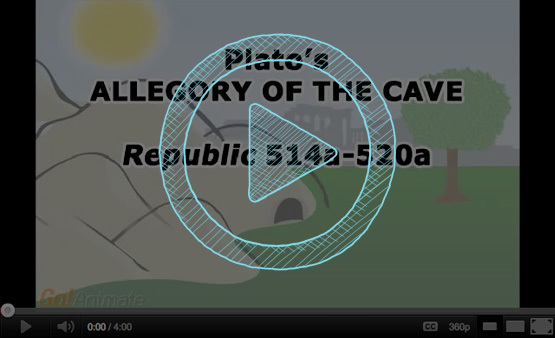 The following is an animation that correlates with Philosophy Bro's summary of Plato's "Allegory of the Cave." The original text (Plato's version) is located in book VII of the Republic, 514a-520a. This animation is relevant to Socratic tradition for several reasons, but most obviously, because Plato used Socrates as the mouth to present this famous allegory. Click the play button below to view this video on YouTube. ENJOY! "Plato's "The Allegory of the Cave": A Summary." Philosophy Bro. 26 Dec. 2010. Web. 06 June 2011. Clay, Becky A. "Plato's Allegory of the Cave‬‏." YouTube - Broadcast Yourself. 5 June 2011. Web. 06 June 2011. < http://www.youtube.com/watch?v=RoOVFO4Qnqg >.